The cornerstone of the Church was set in 1399, as is confirmed by the depicted writings in the choir of the Church. The beautiful Church of late Roman style with Gothic influences, was blessed in 1442. 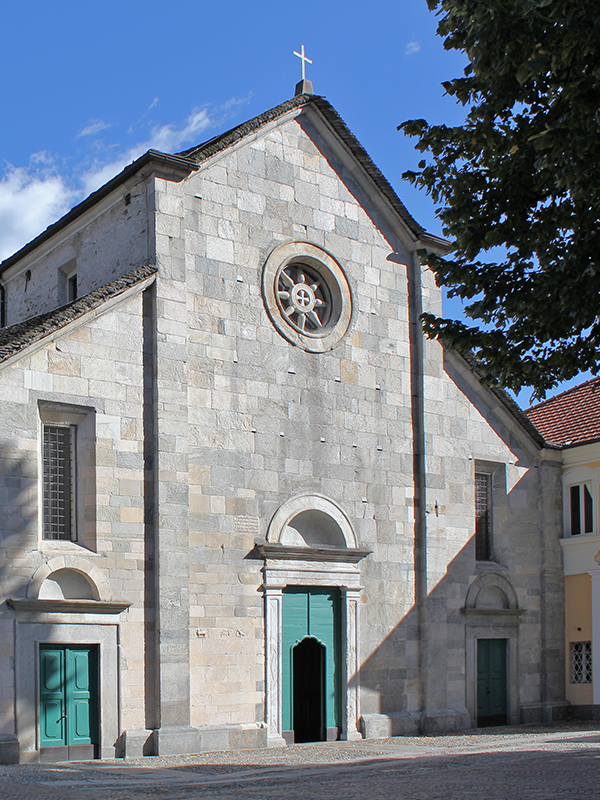 The construction of the Church was desired and financed by the council and the population of Ascona, wishing to demonstrate the devotion of the Ascona people to the Madonna della Misericorida. To the south, at the height of the Madonna della Quercia Altar, a “Roman” Vestry was constructed standing opposite to the “Ambrosian” Vestry at the north side. The only alteration to the architectonic space of the building took place in 1610 when the superiors of the boarding school decided to open a Chapel on the left side of the nave in honor of S. Carlo Borromeo, who had been canonized only months before. The slender and sinewy church tower was built in 1488 and was raised at a later time, most probably after being struck by lightning in 1721: as a matter of fact the higher part of the stonework appears less accurate in comparison with the original, lower part. The pictorial decorations at the outside of the choir are, by now, illegible. For the devoted believer, coming from Locarno or Losone, the enormous flamboyant wheel, measuring approximately 3 meters in diameter and holding the bust of the Eternal Father in vivid colors, this appearance through the green of the vineyards and vegetable gardens, must have been a chromatic surprise. Ceramic decorations, of which four Maltese Crosses are still visible, were set in contrast to the frescoes. The Virgin Mary, young and elegant as a Queen, hosts, under her cloak, the scenery of a certain number of peasants shown kneeling on the left side whereas on the right side the peasants are aligned. There is a mathematical secret within the statement of the pose of the peasant figures, the calm and symmetric gesture of the young Queen, the perspective of the floor panels; all these elements make this particular fresco one of the most lively and, in a certain sense, most “modern” one of the rich collection of frescoes in the Ascona Church. Present day critics attribute the work as coming from the circle of “Maestro Domenico”. The High Altar is without any particular details except for the Scagliola inlay, a work of Giuseppe Maria Pancaldi, on the front of the majestic altarpiece. On every wall of the Church there are frescoes, notably in the choir and, according to the Swiss historian Rahn, representing “the largest fresco cycle existing in Switzerland”. After having been buried under a layer of limestone during the first half of the seventeenth century, because the paintings were considered “old and second-rate” the frescoes were discovered by the Dean of the College, Don Bartolomeo Mercolli in 1891 and gradually uncovered on his and also Don Siro Borrani’s request. 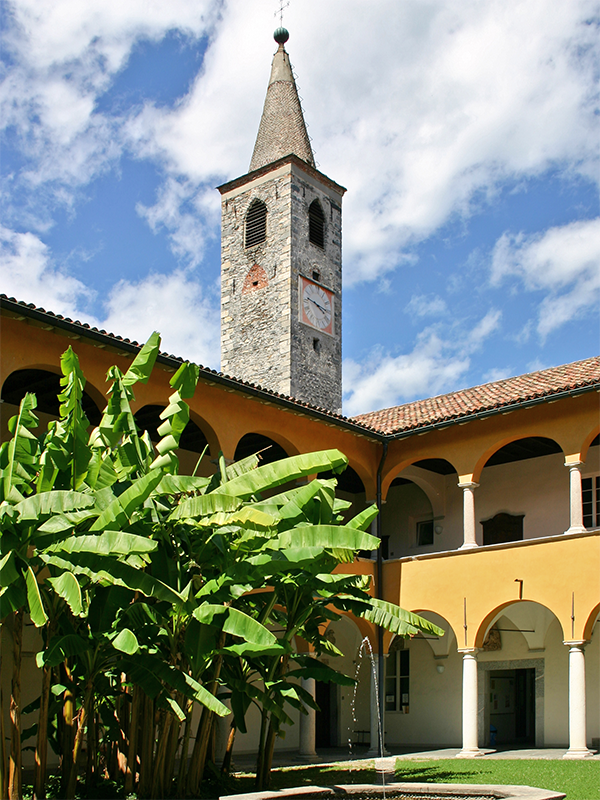 The legal foundation of the convent of San Francesco dates back to 1229, when Anthony of Padua received a donation of land on which to build a Franciscan monastery in Locarno. Most probably the first church was consecrated in 1230 but the documents principally reveal the solemn consecration of 3 days duration from January 16th to January 18th 1316, by order of the bishop of Como. The reconstruction of the Church San Francesco (1538) was entrusted to the Brissago architect Giovanni Beretta and inspired by the model of the medieval basilica San Francesco Grande in Milan (destroyed in the nineteenth century), headquarters of the Franciscan province which, at the time, also included Locarno. The structure, started in 1538 by recovering building materials from the demolition of the Castle and from the construction site of the tower of San Vittore in Muralto, during the time when works on the site were suspended, presents a Romanesque style inspired façade, a plan with three aisles separated by two rows of five columns, three polygonal apses and a large square choir. The side chapels, the stucco decorations and the illusionist scenic painting by Giuseppe Antonio Felice Orelli date back to the 17th and 18th centuries. During the period of the domain of the Swiss the church was the site for the oath ceremonies of the provincial governor "Landfogti" and point of reference for the Locarno aristocracy. The decree of suppression of the monasteries in 1848 resulted in the closure of the church and the beginning of its decline, since from then on it was used as a warehouse until 1924, when it was reopened as a place of worship. The former convent, today housing the Cantonal School of Science, extends to the south of the church and preserves the structures of the two cloisters with arches supported by elegant columns. In the old dining-hall, completely frescoed by Antonio Baldassare Orelli in 1716, you can admire the scenes depicting the Wedding at Cana, the Last Supper, the cardinal virtues and the glorification of St. Francis. The Palazzo Sopracenerina is a refined building in neoclassical style and was constructed in the years 1837-1838. From 1839 to 1878 this palazzo was home to the parliament of the canton Ticino and today the headquarters of the electric power company Società elettrica Sopracenerina are located in the building, that enjoys the magical atmosphere of the Piazza Grande in Locarno. Sought after ambiance, personalised and stylish it is often the venue for important conferences, conventions, concerts, events, science and art exhibitions, thanks to its attractive courtyard, surrounded by twenty white granite columns, its roof renewed by the architect Mario Botta and its welcoming, elegantly decorated conference room. Pleasant aperitifs and coffee breaks can be enjoyed in the courtyard thanks to its proximity to the Bar Verbano. 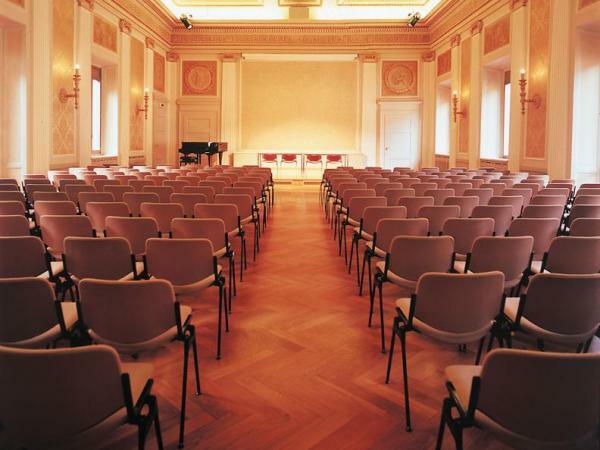 The Serie Début concerts have been taking place in the Palazzo della Sopracenerina since 2014.